The Farm Progress Show in Decatur, Ill., is the coming out party for the new five-model lineup. Fendt is introducing the new 900 Series Vario tractor at the Farm Progress Show this year, a five-model lineup that features 200 horsepower to 300 hp. engines capable of up to 7% better fuel economy thatn previous models. The Other new features on the 900 Series cinlude a reversing operators station on all models, a standard 10.4 inch Variotermianl monitor which puts all tractor controls on one touch-screen terminal, and an option of fully integrated guidance. Fendt 900 Series Vario tractors for 2012 are capable of 7% greater fuel economy over their predecessors by using Selective Catalyst Reduction emissions systems. The base engine on all models of the new 900 Series is a six-cylinder Deutz 7.8 liter with turbocharging. The transmission is Fendt's stepless Vario CVT. Both cooperate through the company's Tractor Management System to provide a 6.6 gallon-per-hour fuel consumption under load. The tractors offer 22 equipment connections, including six rear and two front double-acting hydraulic valves, rear PTO, factory-installed front and rear three-point hitches, and full ISOBUS connection. The maximum lift capacity of the rear lift is 19,800 pounds, while the front is capable of lifting 9,000 pounds. 924 Vario SCR, 200 PTO hp. 927 Vario SCR, 225 PTO hp. 930 Vario SCR, 250 PTO hp. 933 Vario SCR, 275 PTO hp. 936 Vario SCR, 300 PTO hp. (Available in Canada only). 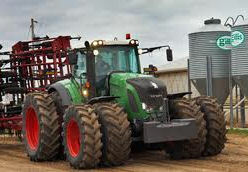 For more information, visit www.fendt.com/us.